Thank you for visiting my Chair of Landscape Architecture at the Swiss Federal Institute of Technology and welcome! As landscape architect, it is an honour to be part of the academic community of the Department of Architecture of ETH in Zürich. The ETH campus brings a rich array of exceptional scientists and critical thinkers delivering the highest possible standard of academic education in Europe. This translates concretely into excellence in our teaching methods, our research tools and in the potential for cross disciplinary projects for students and researchers alike. 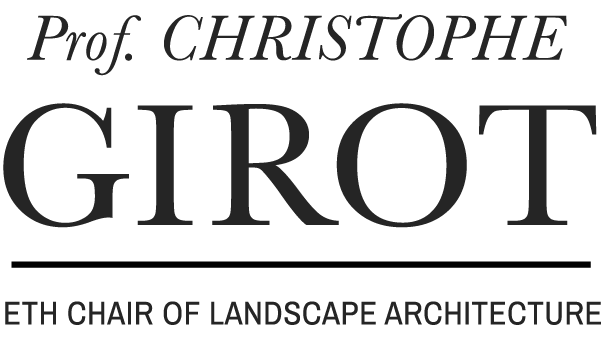 I am proud to announce that landscape architecture is now going ahead with a full MScLArch programme starting in the Fall of 2020. It will thus become an integral part of the regular Masters programmes offered at the ETH Zurich. This results from the joint effort of my Chair and that of Professor Vogt at the Institute of Landscape Architecture, thanks to full support from the Department of Architecture. In addition, our chair currently offers a differentiated range of courses for students and professionals in architecture. It is organized in main areas of research in Design, Media and Theory. Since 2009 the Landscape Visualization and Modeling Laboratory (LVML) has helped to push the state of the art in point cloud modelling further. Courses currently offered include for lecture series in history and theory: Landscape Architecture I + II, Design Studios in landscape topology , Elective Courses in the areas of sound, media and theory and the mentoring of diploma projects, further details of courses on offer can be found in the programme. The Institute of Landscape Architecture was founded in 2005 together with the Chair of Professor Günther Vogt, it will become the main driver of the new MScLArch programme to start in the Fall of 2020. We hope that this new programme, as well as our current course offerings, workshops and services answer the needs of students and professionals, in light of the challenges ahead for the profession.